UK, 2013, 100 minutes, Colour. Michael Sheen, Lena Headey, Sam Neill, Aneurin Barnard, Keeley Hawes, Mella Carron, Xavier Atkins. This is an adventure story, something in the vein of the film and television series of the Young Indiana Jones. This time the young hero is Mariah Mundi (reminding us that traditional British names like Evelyn have been used by males). He is played by Aneurin Barnard, who played celebrated photographer, David Bailey, twice in We’ll Take Manhattan and Legend. His parents work in a British Museum and are experts on antiquities. When they are captured and disappear, it is up to Mariah to find them as well as the Midas box (which gives its own extraordinary powers) for which they had searched. 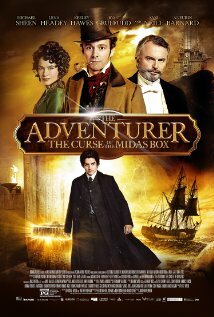 In the action are the adventurer, Will Charity, played by Michael Sheen, and the arch villain played by Sam Neill. There are adventures on a mysterious island, owned by the villain and managed by Lena Headey in cahoots with the villain. Mariah is also searching for his little brother discovered amongst a group of child slaves, working engines under the elaborate hotel (which would give the Grand Budapest Hotel run for its money for its exteriors and the design of the interiors). Will Charity turns up disguised as a magician, confronts the villain, seems to be defeated, leaving Mariah to resolve all the problems. With a shock revelation at the end about Mariah’s father, there was room for a sequel – but, it seems, this was not popular enough for the producers to allot the finance for the sequel. 1. An adventure film for young boys? For family? Parents? Adults? 2. The influences of other adventure films, films about young boys, Indiana Jones, Harry Potter…? 3. London in 1885, the London Museum, the streets, familiar scenes? The transition to the island? The extraordinary hotel, exteriors, interiors? The sea? The caves, the machines, the excavations? The adventure and musical score? 4. The title? The power of the box, transforming objects into gold – a weapon? See it in action at the end of the film? Destroying the villain? 5. The opening, Will Charity, confronting Lugar, the gas, the mask, Will left for dead, his emerging, his being shot? Going to the Museum, the lecture, Charles and Catherine? The two men intruding? The taking of the husband and wife, the mother putting the connections in the children’s pockets? Her final advice? Their going home, the home invasion, their escaping, jumping, going to the reformatory, the kerfuffle, their escape? The taking of Felix? Mariah with Will? The partnership? 6. Lugar, villain, avaricious, collecting objects, antiquities? The members of the Board of Antiquities for the government, pursuing Lugar, getting jobs at the hotel, the final confrontation? 7. Mariah, the map, the travel to the island, Monica and her rebuking him for the entry, his being a porter? Uniform? His room? His work, carrying the cases for the guests? His continually searching for Felix? 8. Sacha, sewing, friendship with Mariah, going home, stealing the food, her father’ anger? His later repentance, coming to her rescue, sacrificing himself? 9. Monica, her haughty attitude, working with Lugar, the staff, her arrogance? Her catching Mariah, their putting her in the cupboard, her emergence, announcing that the magician was a fake? Her death? 10. The magician, his manner, boasting, interaction with Lugar, his performance in the water, emerging among the audience? The guillotine, wanting to get the key from Lugar, Monica interrupting? His literal unmasking? 11. Mariah and Sacha, exploring, finding the caves, finding the ghostly monster, the vehicle, the children enslaved, Felix one of them? Their being drawn back into the whole? Seeing them at work, slaves? Mariah and the reuniting with Felix, taking? 12. The confrontation with Lugar, with Will, the shooting? The cave, the door, the keys shining indicating the box was near, Mariah giving it to Lugar? His using it to destroy people, on the vehicle, Will hanging over the cliff, Mariah using it on Lugar and his disintegrating? 13. The arrival of the officials from the Antiquities Department, the rounding up of Lugar’s men? 14. The awarding of the medals to the children? Mariah inviting Sasha to the house? 15. Catherine being tortured, the arch villain, signing the document, the revelation that he was Charles Mundi?